For high efficiency filtration on cabinets employing forced air cooling. Protects against dust, entrained water, oil and water splash. Metal media is not affected by temperature and not subject to mold or mildew. Filter media is made from multiple layers of crimped wire screen cloth. Panels can be made from R82A aluminum or R82 steel construction. Aluminum R82 panels can have a protective coating applied such as chemical coat per MIL-C-5541 type 1 or anodize per MIL-A-8625 type 2. Anodized panels will pass a standard 200 hour salt spray test. Wide ranges of standard-size R82 filters are available. 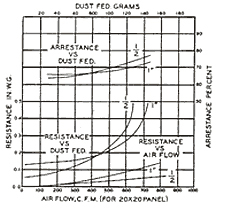 Filter thicknesses range from 1/4” to 1”. The P56 can be cleaned in water and detergent solution or a suitable solvent. When dry, apply an even coat of adhesive. May be service as often as necessary without impairing efficiency. When used in radio or electronic cabinets R82 panels are available with optional RF shielding, thus reducing the amount of R.F. noise produced by static electricity when air passes through the panel. For more information see supplemental sheet, or contact a factory representative.